SUPERMARKET 2012 Stockholm’s Independent Art Fair presents an exhibition by rainbowartsproject (RAP) titled Queer Creatures at Kulturhuset, Sergels torg in Stockholm, Sweden February 17 – 19 2012. The exhibtion the press preview is Thursday the 17th of February 11.30. 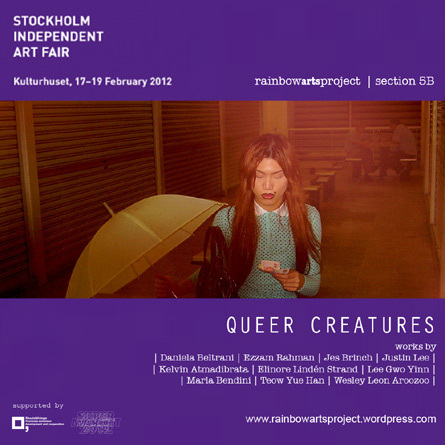 Elinore Lindén Strand, Swedish artist and queer woman describes her art project Queer Creatures / What makes a man, which is at display at the exhibtion, “I focus on different masculinities and on the freedom of not following norms of the physical gender. I started to collect images of boys and men – images which stands out and show alternative masculinities, but also images which adher to the western ideal of how a man must look and how handsome he must to be. Started in 2009, rainbowartsproject (RAP) aims to document, develop and promote queer culture primarily in the visual sector, starting small in Singapore and within the region. RAP is constantly looking into issues relevant to minority groups in particular sexual minorities- Lesbian, Gay, Bisexual and Transgender (LGBT) and social rejects when it comes to being queer and different.